Zuckerberg finally bags honourary Harvard degree 12 years after quitting – Royal Times of Nigeria. 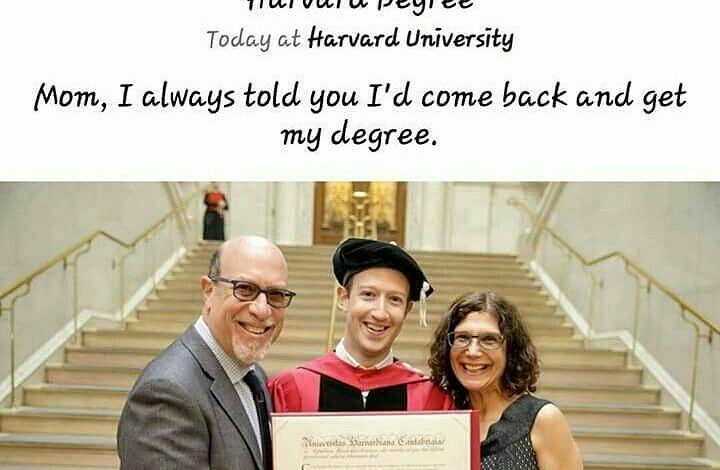 Facebook co-founder, Mark Zuckerberg, one of Havard’s most famous dropouts has finally returned to pick up his degree twelve years after leaving Harvard to work on Facebook full-time. Zuckerberg founded ‘Facebook’ in his college dormitory in the year 2004 and dropped out in November 2005. “I’m not coming back” he told the university paper, The Crimson. His honorary degree comes 12 years later, a little quicker than it took Bill Gates, another famous Harvard dropout to get his. Gates, who left to found Microsoft in 1975, did not receive his honorary degree until 2007. However, Facebook CEO who dropped out to focus on the social networking site, picked up an honorary doctorate degree Thursday.